This news release highlights the observation of charged particles in the form of what is sometimes described as “sprites”, which is an electrical discharge which surges from “below” to “above”. It is similar to the mechanics of a local lightening/thunderstorm we witness here on Earth. To the typical observer, it appears that lightening comes down from the heavens and strikes the Earth; however, it is the intense impulse of charge which comes from the ground which produces high voltage. 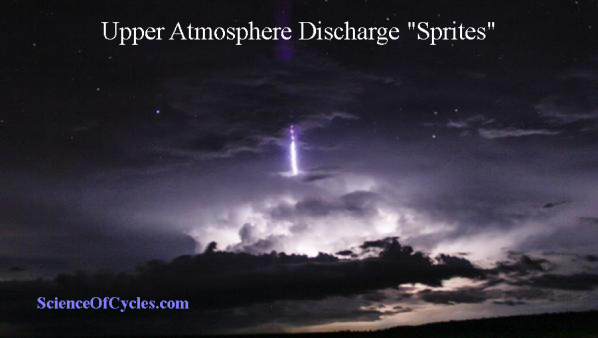 The existence of these upper atmosphere sprites has been reported by pilots for years sparking a healthy debate as to their cause and how they exist. ESA astronaut Andreas Mogensen during his mission on the International Space Station in 2015 was asked to take pictures over thunderstorms with the most sensitive camera on the orbiting outpost to look for these brief features. The cause or effects of these charged particle events are not well understood. Researched data does suggest a connection between Earth’s magnetic field and Earth’s core. 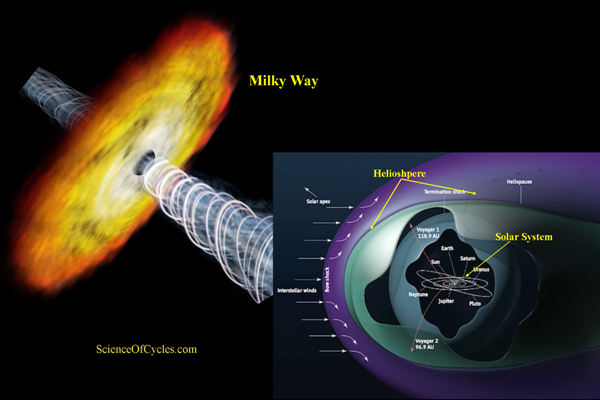 With this hypothesis as a foundation, my personal research suggest a continued conjunction goes beyond our Heliosphere and into our galaxy Milky Way. The blue discharges and jets are examples of a little-understood part of our atmosphere called the heliosphere. The Heliosphere is the outer atmosphere of the Sun and marks the edge of the Sun’s magnetic influence in space. The solar wind that streams out in all directions from the rotating Sun is a magnetic plasma, and it fills the vast space between the planets in our solar system. The magnetic plasma from the Sun does not conjoin with the magnetic plasma between the stars in our galaxy, allowing the solar wind carves out a bubble-like atmosphere that shields our solar system from the majority of galactic cosmic rays.